In the paper, the authors offer some new inequalities for differentiableconvex functions, which are connected with Hermite-Hadamard integralinequality, and apply these inequalities to special means of two positivenumbers. Integral inequality, Hermite-Hadamard integral inequality, Convex function, Mean, Application2000 AMS Classification:26D15, 26A51, 26D20, 26E60, 41A55. Bai, R.-F., Qi, F. and Xi, B.-Y. Hermite-Hadamard type inequalities for the m- and (α, m)logarithmically convex functions, Filomat 27 (1), 1–7, 2013. Dragomir, S. S. and Agarwal, R. P. Two inequalities for differentiable mappings and applications to special means of real numbers and to trapezoidal formula, Appl. Math. Lett. 11 (5), 91–95, 1998. Dragomir, S. S., Agarwal, R. P. and Cerone, P. On Simpson’s inequality and applications, J. Inequal. Appl. 5 (6), 533–579, 2000. Kirmaci, U. S. Inequalities for differentiable mappings and applications to special means of real numbers to midpoint formula, Appl. Math. Comput. 147 (1), 137–146, 2004. Mitrinovi´ c, D. S. Analytic Inequalities, Springer-Verlag, Berlin, 1970. Pearce, C. E. M. and Peˇ cari´ c, J. Inequalities for differentiable mappings with application to special means and quadrature formulae, Appl. Math. Lett. 13 (2), 51–55, 2000. Qi, F. Bounds for the ratio of two gamma functions, J. Inequal. Appl. 2010, Article ID 493058, 84 pages, 2010. Qi, F., Wei, Z.-L. and Yang, Q. Generalizations and refinements of Hermite-Hadamard’s inequality, Rocky Mountain J. Math. 35 (1), 235–251, 2005. Wang, S.-H., Xi, B.-Y. and Qi, F. On Hermite-Hadamard type inequalities for (α, m)-convex functions, Int. J. Open Probl. Comput. Sci. Math. 5 (4), 47–56, 2012. Wang, S.-H., Xi, B.-Y. and Qi, F. Some new inequalities of Hermite-Hadamard type for n-time differentiable functions which are m-convex, Analysis (Munich) 32 (3), 247–262, 20 Xi, B.-Y., Bai, R.-F. and Qi, F. Hermite-Hadamard type inequalities for the m- and (α, m)geometrically convex functions, Aequationes Math. 84 (3), 261–269, 2012. ISNAD Xi, Bo-Yan , Qi, Feng . "Some Hermite-Hadamard Type Inequalities for DifferentiableConvex Functions and Applications". 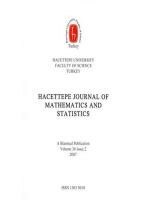 Hacettepe Journal of Mathematics and Statistics 42 / 3 (March 2013): 243-257.